The “hope hop” emcee has the potential to be quite the opposite. Read why in our Nobody Famous album review. 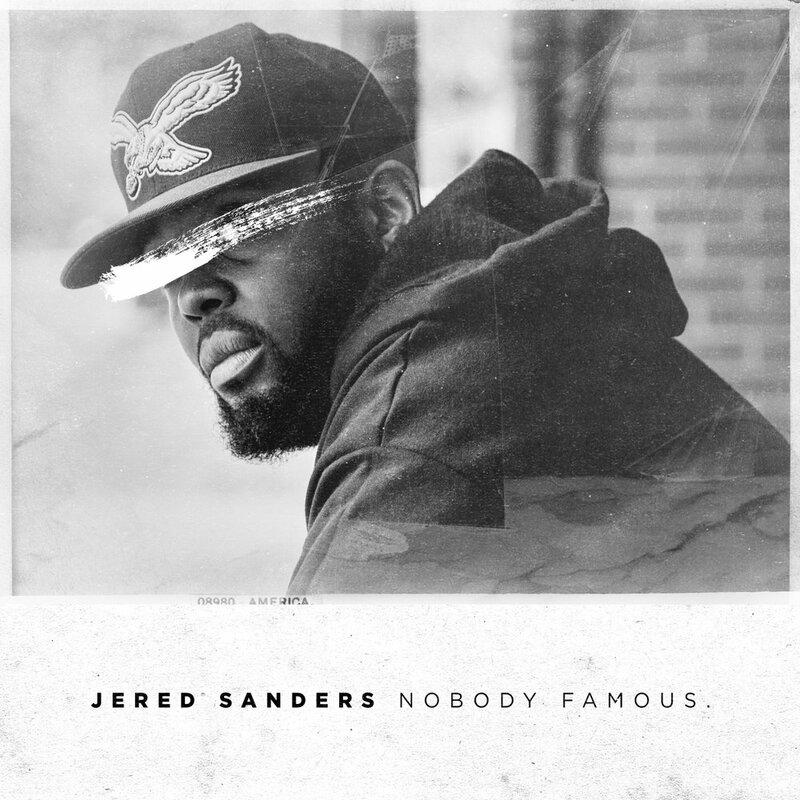 Jered Sanders is not your regular rapper or (as some would call him) christian rapper, for that matter. If you are not familiar with him by now, you need to do yourself a favor and get acquainted. It is not very often that the line between sacred and secular is blurred so beautifully by an artist; providing the listener not only with brain food, but soul food in the same serving. If you go back to his first project “Daylight Savings Time.”, you will get the same consistent truth throughout each record, all the while switching up sounds and styles to reach all types of hip hop audiences. From being a Rapzilla Freshman ’16 recipient, to being covered by mainstream blog sites (DJBooth, AllHipHop, 2DopeBoyz), Jered is recognized for his skill in and out of the church walls. As a pastor and emcee, he gives his audience the best of both worlds. Now as a personal friend of this man, it would be fair to say I am biased and will point out the “Hope is Dope” spokesman as a great emcee. But, to clarify, I was a fan before a friend. To witness the same degree of realness, love, and truth in direct conversation as I do in song, is something that is rare. Jered is the real deal, not just as an emcee, but as a man and Christian. Coming off of his last two projects (Hope is Dope, Black Friday) I was super excited to hear that Nobody Famous arrived perfectly timed for the new year. Track by Track it is a sonic cruise through the styles of Jered is capable of showcasing. It also includes Jered’s trademark audio clip sampling soundscape, which slap different clips that hold relevance to each track between songs guiding you from one into the next, allowing no excuse to not follow along. Overall, this is a solid project that can and more than likely will resonate with not just certain sub-genre’s, but hip hop as a whole. With the accompaniment of lyrical giants like Eshon Burgundy, Kishon, and Shiwan, alongside fire production done by W, Illien Rosewell, Talen Ted, O.L., and Best Kept Secret, the sounds range from boom bap feels (G.E.S.W), new wave trap (Awww Man! ), and even a little Texas Trill (Powin’ Up). Where many artists paint pictures that take attention off of the actual person behind the strokes, Jered paints a portrait of himself from track to track, giving you the most transparent depiction of himself he could give (listen to Daddy Duties II). There isn’t a shift from Christian to Non-believing listener, rather, there is a general addressing of the audience showing who he is, and who we are called to be. Many times we get the idea from Christian art that its for the solely Christian consumer. Jered makes it hard to decipher who exactly he is speaking to, because he speaks truthful and lovingly across the board. There were points where I wasn’t blown away, but I was still able to take something out of each track. Songs like “Awww Man!” are probably well received by the younger audience, but as someone who loves lyrical exhibition, it wasn’t my favorite song. “Blessings” had dope vibes and horns, but didn’t have the same punch as other songs for me. Not sure exactly what (because it had dope features) but I didn’t feel the same pull on this record as the rest of the album. That’s not to say the reader/listener won’t take a liking to these tracks, for they definitely still hold something for someone. Simply put, I’d be surprised to pass this record onto a hip hop lover of any age and receive it back with a bad review. Nobody Famous is an amazing journey in the life of an ordinary man, with an extraordinary gift and mission. I believe listeners will feel a personal connection not only to the music, but to Jered as a person. This generation is in need of genuine artists that put their heart on wax for the sake of building up their fellow man. Agree or disagree with our Nobody Famous album review? Let us know in the comments. Download Nobody Famous at iTunes. Writer for SphereofHipHop.com. hip hop connoisseur. art appreciator. full time human. part time saiyan. I disagree with you. All the records on here are tight. His change of styles reminds me of an early Big Daddy Kane. He is an unique talent. He is skilled to say the least. Also I enjoyed his work with Eshon Burgundy. I call them Big Daddy Kane & Kool G Rap. Salute, My Comrade!